Before school starts, sit down with your child and tell them the plan for lunch money. If school has already started, any time is a good time to start! Explain how much a basic lunch costs and how that cost adds up during the week. You’ll put the money in the account at the beginning of the week and they can remember to stick to the plan by pacing their spending. If they spend too much too soon, they could run out of money. This is a big step in teaching your kid about spending, so be positive and encouraging. If your child runs through their prepaid balance too quickly, take a look at what they are buying. Spending lots of money on bigger meals instead of extra treats means they need more food, which is fine. They are growing! Make sure they get a good breakfast in the morning or pack some healthy snacks to take to school. If that doesn’t fill them up, they might need more money in their lunch account. If you see that your child is overspending on things like soft drinks and desserts, have a talk with them. As a family, determine an appropriate amount of treats for your kid during the week. They may not realize how much they are spending by adding that extra drink and cookie. 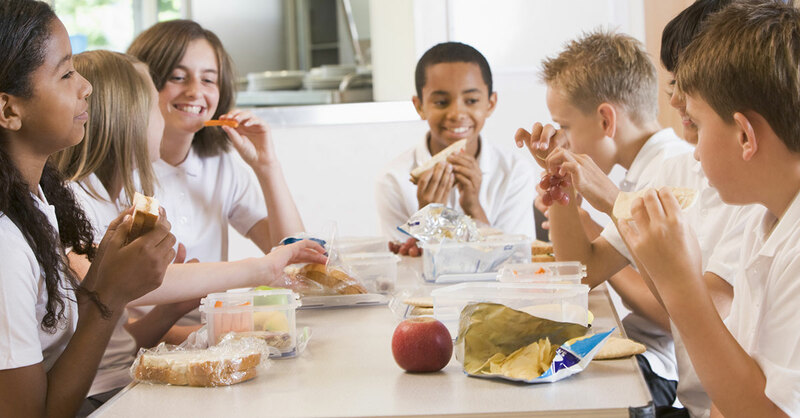 Sending kids to school with cash to pay for lunch may be a good idea for multiple reasons. One benefit is you spend less when you pay with cash because you actually see the money leave. Another benefit? Research shows that kids make healthier food choices when paying with cash. A study by Brian Wansink, a behavioral economist at Cornell University, reveals that three times as many kids buy vegetables when they were paying with cash over debit cards, and they also ate 10% fewer calories. Talk about a win-win situation! Your child can learn about budgeting and making wise choices all at once. It may take a little time, but they’ll get the hang of it. Want to teach your kids about budgeting? Create a lunch budget with EveryDollar. You can set a monthly amount and show your kids how to keep track of it throughout the month. Taking care of lunch and teaching about money at the same time? That makes you a super parent!